In recent years, pho has taken the American culinary world by storm. Known for its deeply flavored broth and gigantic portions, pho is the perfect dish for a cold winter day or for when you’re feeling particularly spicy. 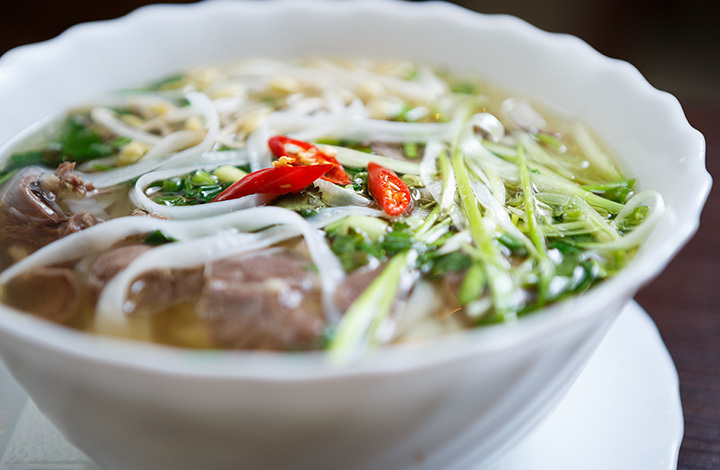 Enjoy authentic Vietnamese cuisine at the eight best pho restaurants in Nevada. Las Vegas has become a food mecca in recent years, with some of the biggest names in the food world opening up stellar restaurants all along the strip. Following this tradition, the Las Vegas pho is an elevated culinary experience, bursting with intense flavor. Few places exemplify this resurgence in popularity and quality better than Le Pho Vietnamese Kitchen. Pho MaiLan brings authentic Vietnamese flavor to Henderson, Nevada. This family-owned and operated business embodies what they call “a few simple principles,” including cooking with love, using the best ingredients, great customer service, and a comfortable atmosphere. On all those fronts and more, they shine. Viet Pho in Caron City, Nevada, offers Vietnamese favorites, including pho, with a vegetarian bend. Order online or stop in for lunch or dinner. Enjoy any of their 15 different pho options, prepared authentically. Nam Van Noodle Café serves “creative, upscale foods in a pleasant setting and at a reasonable price.” The menu primarily includes pho and rice dishes served with a protein. Sign up ahead of time on their website to receive a coupon for your next visit. My Thai & Noodle offers pho with Thai inspirations. The menu refers to their pho as simply “noodle soup,” with nine unique varieties to choose from. You’ll get all the flavor you expect from a great pho and a few surprises, too. The aptly named Pho doesn’t bury the lead: they serve delicious pho and other Asian dishes. The chef specialty menu includes two fantastic pho, including their spicy shrimp noodle soup and spicy chicken noodle soup. The main menu includes 14 additional pho options to choose from. Pho Chopstix is known in Gardnerville, Nevada as a go-to spot to satisfy those hankering pho cravings. The menu is chock full of traditional Vietnamese dishes, including egg rolls, vermicelli, fried noodles, and pho. With over 120 menu options, you’re sure to find something to satisfy any craving. VN Pho in Fallon Restaurant focuses on one thing: serving hot, delicious, affordable pho. Choose from filet mignon, flame broiled pork, rare beef, and special pho options. Another big menu, VN Pho has over 85 dishes to choose from.